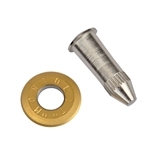 This replacement titanium coated carbide scoring wheel is commonly used with the Montolit P3 series tile cutters. Made of carbon-alloy steel and forged with the latest technology, it combines excellent finishing and precision with a slim line that makes it ergonomic and well-balanced. Montolit Lube Oil for P3 Tile Cutters. 5/pk. 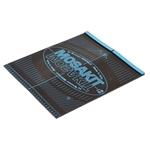 Designed with vulcanized rubber, this rubber mat allows the operator to quickly and easliy cut the majority of the mosaics (glass and ceramic) on the market. 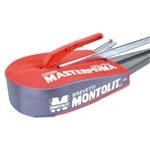 The Montolit Tile Cutter Cover is made with strong fibers, reinforced seams and foam padding placed to protect the most important parts of the tile cutter. Montolit's special tungsten carbide Titanium Nitride coating ensures excellent results on hard ceramic tiles with up to 15 mm thickness. Tungsten carbide scoring wheels. Patented model with new high technology RUBI® alloy; maximum precision and resistant to wear. Rubi Slim System 10ft Manual Tile Cutter for hand cutting porcellanic large format plates. Rubi Slim System Easy Trans for transporting porcellanic large format plates. These Rubi Tile Nippers with Tungsten Carbide Edge is ideal for ceramic tile. These manual cutters are designed for intensive work with any type of ceramic tile and are ideal for cutting porcelain tiles (BIa type). The Rubi Tile Cutter TS-40 Plus is designed for making straight or curved cuts in cement screed and top layer tiles. Rubi Tile Cutter TS-40 is a professional manual tile cutter ideal for making straight or curved cuts in cement screed and top layer tiles. Robust & accurate cutter with angular measurement system suitable for cutting very hard materials. For intensive cutting of ceramic tiles, ideal for Porcelain tiles and Extruded tiles. Sigma 12mm Scoring Wheel 14G for Kera Cut Tile Cutters 8B2, 8C2, 8D2, 8E2, 8G2, 8CE, 8DE. The Kera-Cut features a sturdy aluminium beam used to guide a scoring wheel on a carriage along very large format porcelain tiles.